I am looking at doing an upgrade from the current single exhaust to a dual exhaust system and have a few questions. Through searching the forum I found some answers but still need some clarifications. Is there a somewhat standard distance between the ends of the headers after they are on the engine? I see that most of the exhaust systems I am looking at seem to be long on that end and would have to be cut to fit, but I am more wondering how well they line up with the end of the headers, or if there really is no standard for this and it will vary widely. Does anyone have any experience with this system, and maybe some header recommendations? and just secure them in a factory location, or will that require drilling out holes to make them work? Through my forum search I actually ended up with a new question - is 2.5" too big for a basically stock 350? Someone had mentioned that they thought anything over 2.25" was too big but there was never any further comments on it. If it is just a stock car and you don't plan a lot of modifications to the engine, my suggestion is take it to a local muffler shop and let them put the duals on using the stock manifolds. They can block off the crossover pipe. You don't need anything bigger than 2.25" pipes. Flowmaster is not the best flowing muffler. Most folks on here use Dynomax Super Turbo mufflers. They have a very nice tone and flow better. I have one on my 2012 Ford Expedition and love the sound of it. If you want loud it may not be your best choice. Dual exhaust was a factory option for your car. You can buy reproduction exhaust systems (including all the hangers) that bolt on. If you want headers instead of manifolds, there is no consistency among header manufacturers as to where the collectors end up. The pipe need to be fitted to whatever headers you select. Personally I would use a mandrel bent aftermarket exhaust kit (like Pypes). The reproduction pipes and pipes fabricated by a muffler shop will not be mandrel bent and will be squeezed at the bends as a result. Thanks guys, sounds good. So basically it sounds like I should pick my exhaust kit and pick my headers. Then get the headers on, and mount the exhaust with whatever hangers are required to get it hanging and secure where I want it, and then there will be some work to get the ends of the exhaust system to connect to the ends of the headers. 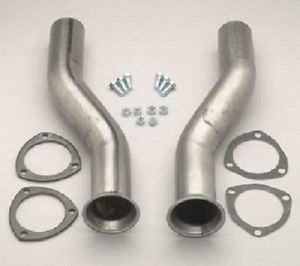 I did just read that some people do what I said above, and then just use some flex pipe to temporarily connect them to get it to a muffler shop so that the connecting pieces can be fabricated. It is too bad there doesn't seem to be a complete system from headers back to tail pipes. How would you do that? Every header manufacture is different. Every engine type is different. The number of kits would be astronomical. In any case, most header style exhaust kits just use extra long pipes. You just cut them to where you need them and attach to the collectors. Depending on the headers and exhaust kit, you likely will need S-pipes. I know, I more meant that as a it would be really nice and easy kinda way, not that they should or that there is any logical or sensible way to do it. At least there are kits made for the car that get you 95% of the way there. This will be a winter project anyway so there will be lots of time to sort it all out and get it working right. I just want to make sure I have as much of the hangers and pieces as I can before I start. I didn't have any issues installing headers on my 1970 Supreme 350 that came with factory dual exhaust. Just cut the head pipes at the appropriate location and welded them to the collectors. The 71 convertible came to me with aftermarket duals that were just as easy to connect up to headers - just cut the pipes and welded the collectors. I put hedman hedders (#58060) installed a few months ago and they fit perfectly. The H pipe was modified to clear the driveshaft. I’ve got flowmaster super 44 & 40 on it and originally had them dumping out by the rear seats but there was too much exhaust coming in the car when it was stopped so I got the pipes extended out the back since the video.